‘Culture’ is one of those mystical and elusive terms. It often surfaces in a hallway, manager and all-hands discussions as if it’s a kind of separate entity of its own, something that made itself, something that could be changed or tinkered with independently of the other elements that make up your business … and when we talk about “changing it,” it’s spoken about as if it’s a switch you can flip, a lever you can pull, and an initiative we need to implement. I suppose if it were like that, it might make things simpler. But it’s not. Your culture might just have the chance to really change when you get to the real stuff. Things like espresso machines, free lunches, and business casual aren’t the point. If you want a culture that oozes more positive juju, then you have to look at how it was formed in the first place—those things that are contributing to making it that way. What you do advertently or perhaps inadvertently do, say, and convey as a company and as leadership? Here are some of the questions we ask our clients to explore about themselves to begin really deep diving into how we do things around here and subsequently how the “culture” got to where it is now. How do you set priorities and goals? 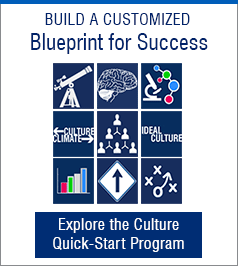 Is this process consistent with the kind of culture you want to have? How does accountability show up in your organization – how is it established and maintained? Are there accountabilities for line-level employees but not for leadership? Do you have the appropriate metrics or do employees feel they have impossible standards to meet? How is information shared? Does leadership only share on a need-to-know basis? Are employees fearful to share and thus, hoard information because that’s what keeps them valuable to the company? Does leadership share early and share often, even before they feel a strategy is ready for prime time? What are the priorities in company communications to employees? What is it that is actually getting airtime in your organization? Is it something the employees can get behind, they can understand, they feel proud of? How is the truth shared and sought? Do things get pushed under the rug? Are things out in the open? How do decisions get made? Who is involved in this process? Is it leadership ‘do the thinking’ and employees ‘do the doing’ without opportunity for input? How does delegation occur? Is it truly effective delegation or is it relegation? Ultimately one party wiping their hands of it and passing the buck. How are ideas shared? Are they occurring freely? Do employees want to contribute their best ideas to the company knowing they’ll be given a fair shake or chance to succeed? How does collaboration occur? That is, does true collaboration actually occur? Are people incented to contribute to the collective or only as individual performers and how well they do their respective jobs? How are rewards given? Are brilliant jerks rewarded even if their ruthless personalities degrade morale and teamwork? Are rewards given inconsistently across the organization? How do punishments occur and how are mistakes handled? Do people that hit a bad patch get another chance? Does anyone ever really get fired for poor or non-performance? Do some people get worse punishment simply because they have different managers? How valued is learning? Are you the type of organization that helps people to grow and deepen their expertise—or do you tend to pigeonhole and hold someone back because you need them in a specific role or effort? Do you provide opportunities for mentoring and growth—or do your employees hide their lack of experience and understanding because they’re afraid they’ll be penalized for not knowing? How are people’s efforts appreciated? Are you the type of organization that gives an “A” for effort? Or, is “hard work” irrelevant with knowledge that only effectiveness (not effort) is rewarded? How are risks encouraged and taken? Does risk taking apply to everyone or just a few of the top rung? Do you encourage innovation and a fail-fast mindset? Do you say you want innovation but shoulder employees with metrics squarely based on execution? How are successes celebrated? Is it something that is done publicly? Is it something seldom done? Are stories shared far and wide? Are successes celebrated in a way that is meaningful to employees? Have you asked them what is meaningful to them? You can also use these as a guide to think about the organization you want to have—and subsequently, a culture that better matches and is more congruent with your objectives as a business. Are there areas or questions we’re missing? We welcome your comments and would love to hear where you think culture lives in organizations. Adapted and reprinted with permission from robertsgolden.com. Sara Roberts is an author and “go-to” expert on organizational transformation, culture, and building purpose-led companies. She’s an executive consultant to Fortune 500 leaders, a sought-after keynote speaker, and an entrepreneur. Sara founded and sold Roberts Golden, a boutique consultancy, where she and her team worked with nearly a quarter of the Fortune 100, over its 12-year span, to help transform their cultures and ability to lead. Her latest book, "Nimble, Focused, Feisty: Organizational Cultures that Win in the New Era and How to Create Them," is available on Amazon, or learn more at NimbleFocusedFeisty.com.